Henry C. Bridge and Grace E. Bridge of Medfield in the County of Norfolk, bring this petition under the provisions of G. L. c. 185, Sec. 1, as amended, to register and confirm their title to a parcel of land (hereinafter referred to as "locus") situated on the northeasterly side of South Street in the Town of Medfield. The premises are shown on Land Court Plan No. 37985[A] filed with the petition. Respondent Kingsbury's answer claims in herself record title or in the alternative title by adverse possession in so much of the locus as is included in a certain triangular piece of land located in the northwesterly portion of the locus and shown as Lot X on the sketch plan attached hereto as Appendix A. The case was heard on May 2, 1975 and May 14, 1975 and a duly appointed and sworn stenographer recorded and later transcribed the testimony. The Court took a view of the locus in the presence of counsel for both petitioners and respondent on Monday, July 14, 1975. Briefs were filed on November 21, 1975. At the trial, twenty exhibits including the abstract and filed plan were introduced into evidence and all are incorporated herein for the purpose of any appeal. All book and page references are to documents recorded in Norfolk County Registry of Deeds unless otherwise noted. The sole question to be determined is whether the petitioners have registerable title to Lot X on the sketch plan. The burden of proof concerning the registerability of title to land is on the petitioners. Hopkins v. Holcombe, 308 Mass. 54 , 56. Lot X is triangular in shape and is bounded on its base by a wall on South Street where it measures 42.62 feet as shown on the petitioners' filed plan. The northwesterly line of the "triangle" measures 344.01 feet and is not bounded by a wall. The southeasterly line, which is bounded by a wall, measures about 350 feet. The view taken and the filed plan both show that this wall on the southeasterly line forms a part of the rear foundation of a garage on the locus, and that this same stone wall, southwesterly of the garage and near South Street comes to within eight feet of the dwelling house located on the locus. Additionally, the view disclosed a stone wall marking almost the entire northerly line of the locus except for a gap of some 60 feet in the southeasterly portion thereof. The southeasterly line is also completely bounded by a stone wall except for approximately the easterly 28 feet thereof. The southwesterly line of the locus on South Street borders on a stone wall along the southwesterly 147 feet thereof; then there is a gap in the wall of some 155.38 feet in front of the dwelling house; finally there is a resumption of the wall running northwesterly well past Lot X claimed by the petitioners. These walls are delineated on the sketch plan. There is a dispute between the parties as to whether parcels A, B and possibly X as shown on the sketch plan were, prior to 1848, part of the "Church Land" coming from the estate of Elisha Clark who died in 1839, or were "Common Land" set off by the selectmen in 1670, as is claimed by the respondent. It would seem to make little difference as the parties agree that the disputed parcel, Lot X, is contained in a deed from Sophia Mason to Drusilla Hamant, dated June 22, 1848, recorded in Book 991, page 589, containing 2 acres 3/4 + 16 rods ±, found on Page 37 of the petitioners' abstract, Exhibit No. 2, and hereinafter referred to as "the 1848 deed". Easterly and Northerly on land of the late Hannah Clark of Medfield". It should be noted that this deed was not recorded until the year 1905. Westerly or southwesterly on land of said heirs to the point of beginning at said street." This is shown on the sketch plan as Lot A and perhaps X, and on the filed plan as locus. The line recited as running "Westerly or southwesterly on land of said heirs to the point of beginning" is the line in question. It should be noted that there is no reference in this description to stone walls. The distance of the southwesterly line of the street and the northeasterly line by land of said heirs (of Sophia Mason) is 12 rods, or 198 feet. The description commences at the southwesterly corner of land of Sophia Mason, now owned by the respondent, but the point of beginning is not designated as being marked by a bound or stake or otherwise. The southeasterly line is set forth as being about 21 rods, or 346.5 feet, some 36 feet less than as shown on the filed plan. The distance of the northwesterly line is not given. thence by sd South Street and the wall Southeasterly 149 ft. to the corner first mentioned." Note that for the first time mention is made of stone walls and also that the northerly line where it borders Lot A is set forth as 383 feet which agrees with the measured length as shown in the filed plan but is some 36 feet more than is shown in the description in the "1879 deed". The land contained in the "1848 deed" was thus divided into two parcels, one being Lot A and perhaps Lot X as shown on the sketch plan conveyed by the "1879 deed", and the second being Lot B as shown on the sketch plan conveyed by the "1912 deed". These two parcels came together in the petitioners by two deeds, one from Henry C. Bridge to petitioners dated February 20, 1962, recorded in Book 3966, page 593, and the second from Mary E. Bridge to petitioners dated February 20, 1962, recorded in Book 3966, page 596. The sum of these two deeds, however, has to be the land described in the "1848 deed" which, as has has been pointed out, bounds the parcel on the north and east on land of the late Hannah Clark of Medfield, the predecessor in title to Sophia Mason. The "1848 deed" and the "1879 deed" make no mention of stone walls. Respondent claims title to the land lying northwesterly of Lots A and B on the sketch plan, the so-called "Homestead Farm" of Sophia Mason, by mesne conveyances to Florence Mason Calder and thence by her to Ella Marcionette, respondent's mother, dated October 12, 1909, and recorded in Book 1125, page 441, from whom respondent inherited it. The description in the above deed is identical with that in the petition of the guardian of Sophia Mason for a license to sell real estate (Exhibit No. 3) in 1855. The pertinent calls in both descriptions where the property bounds land of petitioners are as follow: "thence westerly by said Hamant's land to a corner of land now or formerly of Caleb Hamant (petitioners' predecessor in title and Lot A on the sketch), thence by land of said Caleb Hamant northerly to a corner (this is the northeasterly corner of that part of the locus shown as Lot A on the sketch), thence turning at nearly a right angle (emphasis added) by land of said Caleb Hamant (Lot A), westerly to said road leading from Walpole to Medfield". No wall is mentioned in either description, although the view disclosed the presence of a wall now as is indicated on the sketch plan. Petitioners' argument depends upon the testimony of their engineer and surveyor, who stated that he found the bound marking the southerly corner of the "1912 deed" and that he measured from this bound 149 feet northeasterly to a point that is just beyond the end of the wall on South Street, which he determined to be the northwesterly corner (Lot B on the sketch plan). From this point he then measured 12 rods (198 feet) as called for in the "1879 deed" to a point which he determined to be the northwesterly corner of the locus, which is shown on the sketch plan as the northwesterly corner of Lot X. This point is, in turn, 42.62 feet north of the junction of the walls marking the northwesterly corner of Lot A as shown on the sketch. 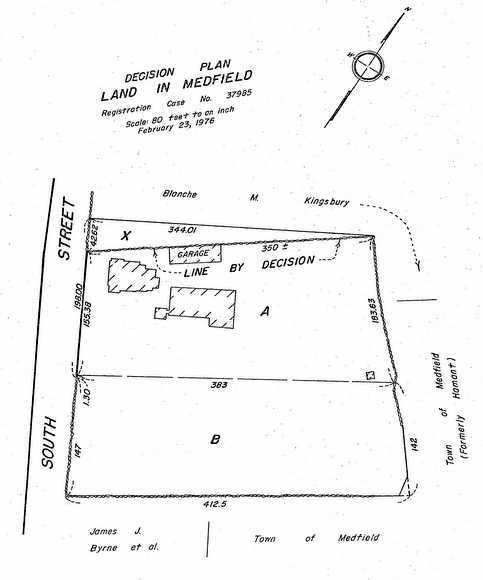 This "1912 deed" granted 1-1/3 acres and as measured on the filed plan it is computed as 1.31 acres (Lot B on the sketch plan) not including some 172 ± square feet in the southeast corner conveyed to the Town of Medfield for drainage purposes. The "1879 deed" called for an an area of 252 square rods of 68,607 square feet and the filed plan shows a lot, shown as Lot A plus Lot X on the sketch plan, that contains 68,633 square feet, 26 square feet more than called for. Thus, as drawn, the filed plan follows deed measurements with but two exceptions and results in enclosed areas very close to those described. The first exception is the easterly line of the locus. The "1879 deed" calls for an easterly line of 12 rods (198 feet) measured from the southeasterly to the northeasterly corner. The "1912 deed" calls for an easterly line of 142 feet. The filed plan holds the 142 feet as called for in the "1912 deed" on the southerly parcel but it does not hold the 198 feet as called for in the "1879 deed" on the northerly parcel. The filed plan shows that by holding the 142 feet called for by the "1912 deed" there were only 183.63 feet remaining, some 14.37 feet short of the distance called for in the "1879 deed". One wonders why this easterly line was not extended to get the required footage rather than extending the westerly line at the street line, as was done. The second exception is the 36 foot discrepancy of the line connecting Lots A and B on the sketch plan. There are several compelling arguments which contradict petitioners' view of the location of the northerly line of the locus. First and foremost is the physical appearance of the locus as seen on the view. The whole area set forth as Lots A and B on the sketch plan is outlined by stone walls, even though there are gaps in them. The walls themselves on all but the northwesterly side are of the same type, being country-type walls made up of large roundish fieldstones loosely piled some 2 to 3 feet in height. The wall on the northwesterly line is slightly different in that the portion of it from South Street running northeasterly to the garage, as shown on the sketch plan, is a more carefully built fieldstone wall, fitted at the top with some cut and flat stones. Continuing in a northeasterly direction, the wall then forms the rear foundation of the garage, and, beyond the garage, reverts to the country-type wall as found on the other three sides. Taken together, the walls are persuasive as monuments marking the area of the 2 acres 3/4 + 16 rods ± parcels as described in the "1848" deed. In addition, the walls as they join at the northwest corner as shown on the filed plan and as the northwest corner of Lot A on the sketch plan form almost a right angle. The filed plan shows the northerly line forming the angle as creating an angle markedly greater than a right angle. This does not coincide with the description set forth in the petition for license to sell filed by the guardian of Sophia Mason in 1855 (Exhibit No. 3), reading as set forth heretofore: "thence ... turning at nearly a right angle". (Emphasis added.) The walls as they presently exist form more nearly a right angle at the northwest corner of the locus as called for in Exhibit No. 3 than does the proposed northerly line of the filed plan, shown as the northerly line of Lot X on the sketch plan. It should be further noted that in all the plans of this area other than the filed plan, the northerly line has always been shown as following the wall. These other plans include those six plans referred to on the filed plan, itself, and that of the Town of Medfield Assessors', Sheet 37, Lot 139. The 1972, 1971 and 1918 Assessors' Plans of the Town of Medfield likewise do not show the line to be as claimed by petitioners on their filed plan but rather as shown following the wall along the northwesterly side of Lot A on the sketch plan. The Court gives little weight to the argument that respondent paid the taxes on Lot X. While both parties paid the tax bills rendered to them, neither paid particular attention to the description of their land contained therein if, indeed, the description had any significance. As between distances and areas and monuments, the last is predominant. Burke v. Commonwealth, 283 Mass. 63 , 67. The stone walls delineating the whole locus provide ample monumentation here. The Court finds that the northerly line of the locus sought to be registered and confirmed is bounded by the wall as shown on the filed plan and that the lot marked "X" and on the sketch plan is not included in the petitioners' title of record. Petitioners and respondent each make claim to Lot X on the sketch plan under the theory of adverse possession, both alleging open, notorious, continuous and exclusive use under a claim of right for a period in excess of twenty years. There is no question that the petitioners and their predecessors and tenants have made use of that part of Lot X which runs from South Street easterly to a point near the rear of the house before reaching the garage. There are steps from petitioners' dwelling up the wall, as the land to the northwest of the wall is on a somewhat higher plane. The wall under discussion serves as a retaining wall from the street back almost to the garage. The part of Lot X northeasterly of the garage is a jungle, which has obviously not been used for many years. The use made of that portion of Lot X near the house has been sporadic. Children have played there and vegetables have been planted in a garden maintained there for some years. It is significant to note that before a portable building was placed on Lot X during the early part of the century by petitioners' predecessors in title, permission to do so was first sought from respondent's predecessor in title. On all the evidence the Court finds that the use of this area was not sufficiently open, notorious, continuous or exclusive for a period exceeding twenty years to support a claim to title by adverse possession. Accordingly, the Court finds no title in petitioners under the theory of adverse possession to the area marked Lot X on the sketch plan. Having thus found, the Court will make no finding in regard to respondent's claim to title by adverse possession to the area. The court grants respondent's request for rulings numbered 1, 2, 4, 5, 6, 7, 9, 14, 15, 16, 21, 22, 23 and 24; denies those numbered 3, 11, 12, 13, 17; and finds those numbered 8, 10, 18, 19 and 20 not applicable. The Court rules that the petitioners have title proper for registration to that portion of the premises described in the petition and shown on the filed plan lying southeasterly of the stone wall shown on the filed plan, the northwesterly point of which is 42.62 feet southwest of the northwesterly point of the claimed locus on the filed plan. The Court orders that that part of the petition describing land northeast of the stone wall shown on the filed plan and illustrated as "Lot X" on the sketch plan be severed and dismissed and that the title to the remainder of the land described in the petition be registered and confirmed, subject to such other matters as may be raised in the abstract and not now in issue here.